The first guest today is Cody Kay, the winner of the 2018 Sonoma County home brewers competition. As the winner, he gets to brew his winning “Durstlosher” beer by special arrangement with 101 North. Steve welcomes Mark Carpenter and wonders when he will ride his horse down from Petaluma for a Thursday afternoon show. After Herlinda tells about Wilibee’s and their special stock, Herlinda introduces Cody Kay, who is 28 and has just won the Sonoma County Home Brewers Competition, produced by the Petaluma Downtown Association, at the Petaluma Fairgrounds. This year they did it at 101 North, who is a sponsor. The winner will have his brew produced professionally and sold by 101 North. Cody is actually brewing at home, for now, 5 or 10 gallons at a time. Mark and Herlinda both like it. The name “Durstlosher” means thirst quencher in German. The tag line is “beer-flavored beer.” Mark says it’s very authentic, a great German Helles. Herlinda likes the crisp finish. Cody was Herlinda’s star student at the Sonoma State University’s Craft Beer Appreciation Class that she coordinates. Steve asks what Cody’s setup looks like. A big stock pot, something like a propane burner and a few “contraptions” here and there. You can make beer with pretty rudimentary equipment and it takes up the whole house when he gets going. He has been home brewing already for a few years and his friends and family liked it, but it’s nice to hear the tasters from the big breweries like it too. Even with IPAs being so popular, this beat them all out, with its different style. Herlinda says that many brewers started as home brewers. Mark says he didn’t even go to school, he was lucky to get a job at Anchor. Mark says that Cody Kay’s beer is a very nice traditional German Helles, with a nice hoppy flavor that is not bitter. It’s 4.6% alcohol. Herlinda points out that Americans are used to higher alcohol beer. As a winner, he made the beer in early January 2018 and it was released, mostly in draft, for the next few weeks. Several beer gardens that carry 101 North will carry his beer. Herlinda asks Cody how much her class influenced him. He replies that the beers had so much depth and complexity that he decided to find his style in a different way, with a lighter beer. Cody says that he would welcome the chance to work in brewing and his home brewing experience was useful. Representatives from the Northern California Hop Growers Alliance are in today. But first, Steve asks Mark to recap his early career at Anchor. Mark tells that he had been working for the telephone company for ten years but wanted to do something more interesting. He was lucky that Fritz Maytag hired him at Anchor Brewing in 1971, where he became brewmaster. While they are tasting a triple IPA, Herlinda introduces Michael Stevenson and Paul Martin. Mark says that there used to be a lot of hops growing in Sonoma County and there are so many local breweries. But Yakima Valley, eastern Washington, is more economical for hops. Even if they grow well in Sonoma, to compete with Yakima is tricky. The growing conditions are different in Sonoma. The hop growers, before the craft industry, they just wanted hops that had commercial hops with more bitterness, more pounds per hops and more disease resistance. They didn’t care about flavor or aroma. Then, small brewers would pick the varieties that had unique aromas. 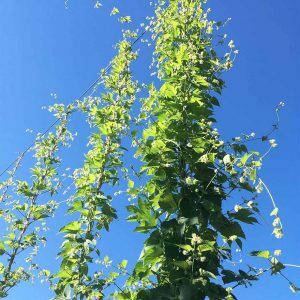 So now all the major hop growers are testing to find unique hops. That’s why Mark thinks the local alliance is in a great position to grow unique hops. They also notice different flavor profiles depending on where the same hops are grown. The concept of terroir is applicable to this industry as well as to the wine industry. They can make wet hop beers if they can get the hops to the brewery within an hour. 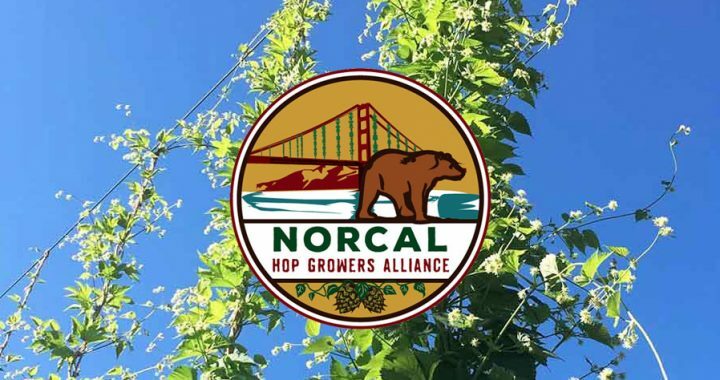 The hop growers will hold a seminar at the SRJC Shone Farm on Saturday, March 24, starting at 8am. This is their third annual event, with many guests including prominent craft brewers and guest speakers. There are about 15 small hops farms spread around the North Bay, including Carneros, Napa, Lake County, Mendocino, Petaluma etc. They’re difficult to grow if you want a high quality product and they are working on best practices in their monthly meetings where they share information about research and practices. They will also have Chris Fregoso, a post-doc researcher in plant genetics at UC Berkley, who is interested in developing a hops variety that is ideal for California. 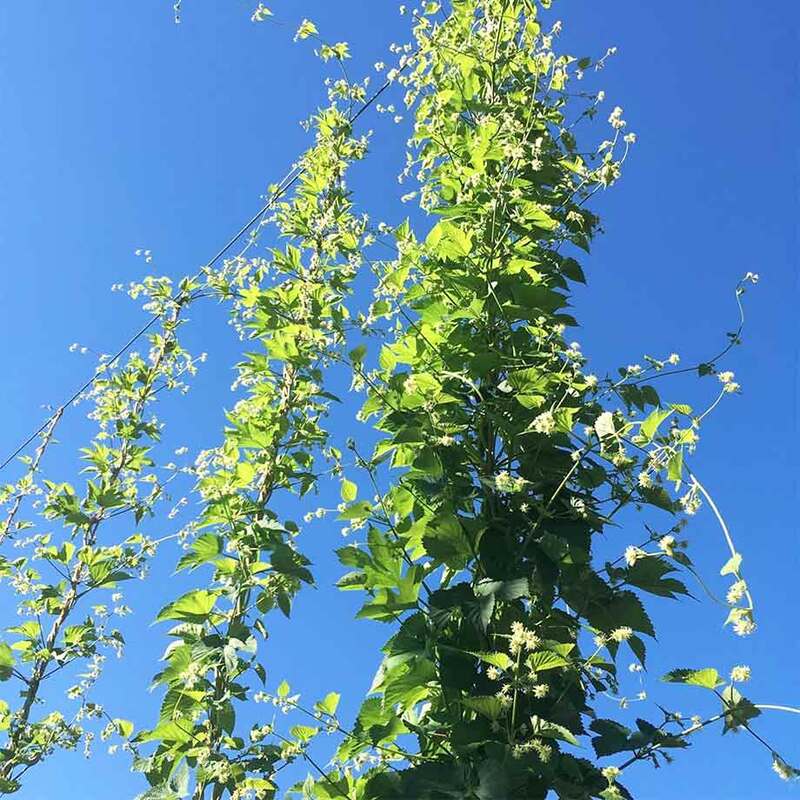 Some farmers and ranchers are exploring hops as a way of diversifying. Most growers are selling “wet hops” which are freshly picked. Mark Carpenter tells about the spring growing season when shoots grow out of the base of the plant. He says in Germany some people eat them as a seasonal vegetable. Mark thinks that local restaurants here might be interested.